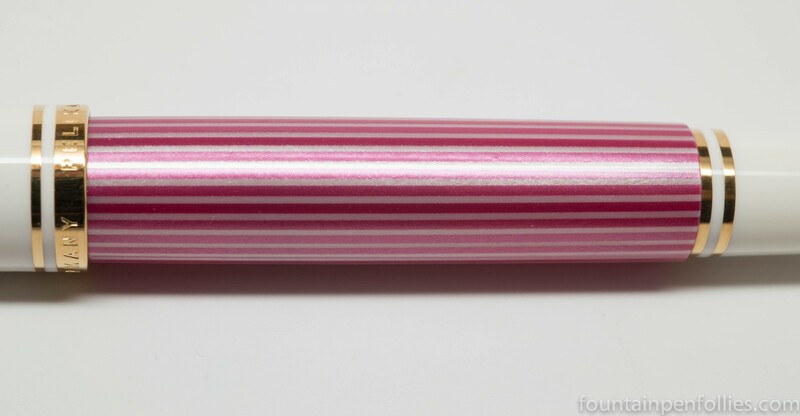 I couldn’t wait to share a quick look at my Pink Pelikan, the new M600. In person, the color is more raspberry than hot pink. I know some people are having fits over a pink Pelikan. But this is not very wild, for a pink. It’s dignified, actually. The binde is blend of light and dark pink stripes. It is not translucent. It shimmers. You cannot easily see the ink level. I want to thank the nice people at Iguana Sell, from whom I bought this. They outdid themselves with great service and great communication, not to mention very fast delivery, all at a great price. It looks lovely. I’m envious. oh wow! This is even prettier than it looked on the product photos. The raspberry pink works even better than the hot pink for the cream and gold. This is a pink pen for grown-ups – very stylish. Beautiful. What did you think of the packaging?